High-speed cutting equipment challenges downstream fab-shop operations to keep up. Stepping up the pace at press-brake cells are new features such as automated tool changes with on-board tool storage and on-screen setup instructions for operators. 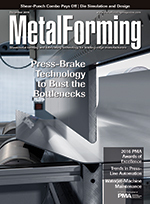 The Precision Metalforming Association (PMA) presented its 2016 Awards of Excellence in Metalforming at FABTECH in Las Vegas. The awards recognize the high standards of achievement set by the metalforming industry in the areas of design, product development, safety, process control, quality, productivity, training and education, and innovation and technology. A single communication protocol reduces the need for a spaghetti network and multiple software programs, improving line operation and simplifying maintenance. Improper maintenance of waterjet systems can cause inaccurate production, increased use of consumables and, most importantly, machine failure. Heres some sound advice to keep your systems cutting accurately and productively. Shear and punch fabrication of sheetmetal parts at custom door manufacturer LaForce, Inc. more than triples thanks to implementation of a new servo-electric punch-shear combination machine. Through innovative use of die-face-design software, Autodie can quickly and economically engineer and construct auto-panel tools. A video did the trick for Diamond Metals Distribution, as the company found an effective alternative to plant tours.